SQL Clone is a database provisioning tool that lets you create full copies of SQL Server databases and backups in seconds, using around 40 MB of disk space per clone. Instead of spending hours provisioning multiple copies of your database for development, testing, or diagnostics, SQL Clone creates a single ‘image’ of a SQL Server database or backup, which is used as the source for multiple clones. Each clone works just like a normal database, but takes only a few seconds to create and requires only around 40MB of disk space. With SQL Clone's web app and built-in PowerShell automation, DBAs spend much less time on provisioning requests. Meanwhile, developers and testers can work on up-to-date, isolated copies of the database to speed up development, accurately test code, and fix issues faster. It requires about 5 TB of disk space to create or refresh ten copies of a 500 GB database, when you use a traditional provisioning technique such as restoring from a backup. SQL Clone creates just one full copy, called an ‘image’, and then multiple clones can be created from that image. Changes made to a clone are stored locally, so each clone is independent of any other. Even a 64 TB database requires only tens of MB of local disk space and, suddenly, creating ten copies of a 500 GB database requires only a little over 500 GB of initial storage space. This smart reuse of bytes removes the need to spend hours juggling disk space, and allows teams to work in isolation on their own workstations to develop, test and fix code. Even if you have enough disk space to accommodate multiple database copies, traditional provisioning processes are fundamentally too slow to support the team’s requirements. SQL Clone allows you to copy a database up to 64 TB in just seconds. This rapid provisioning allows individuals to work on their own isolated copy of the database, test in parallel and experiment while being able to refresh clones in seconds, on demand. With SQL Clone's PowerShell automation, images and clones can be created easily and quickly, for example during a night-time maintenance window. 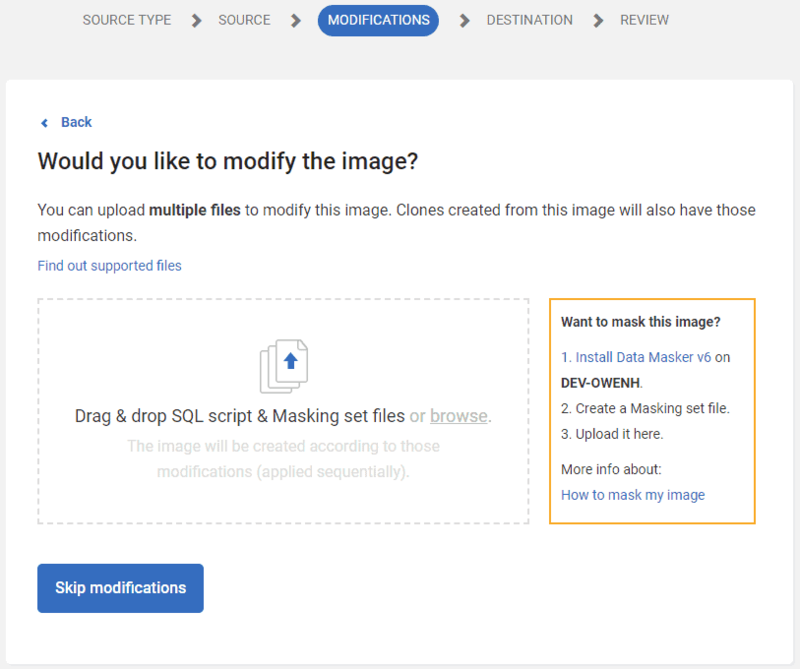 The SQL Clone web app offers a single source of truth for the creation, management and removal of images and clones. The architecture of SQL Clone means you have a central view of what clones have been created, how much disk space they are using, when they were created, and by who. The masking or removal of sensitive data can be applied to a clone allowing you to keep data secure. 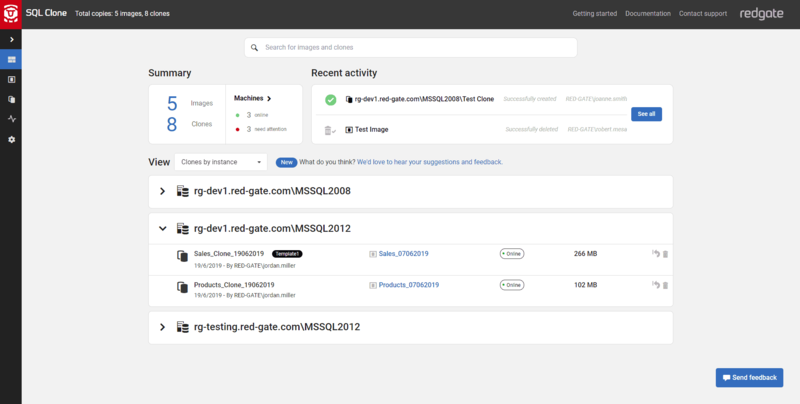 Inbuilt access permissions allow you to control who in the team can create and manage clones using the SQL Clone web app. So, whether you allow your team to self-serve clones and want transparency over what has been created, or you just want a central place to create and manage clones yourself, SQL Clone makes provisioning simple. The more of a DBA's time is free from tasks such as restoring backups and juggling disk space, the more effective they can be in helping improve the team's DevOps processes, offering advice on concerns such as database architecture, performance, security or configuration. With SQL Clone, developers can work on isolated databases, free to experiment without fear of disrupting the work of others. Likewise, the team can achieve much more in the testing window because they have a fast, reliable provisioning process that allow them to spin up multiple copies of a database quickly. Realistic data sets can be incorporated into their testing cycles, making it possible to find data compatibility issues earlier in the release pipeline. The result for the business is a shift towards continuous delivery of tested, reliable changes to the customer. Remove the risk of exposing sensitive data in non-production environments by running masking operations during the image creation. Clones will contain masked data and will look and perform like real data for development and testing purposes. SQL Provision integrates SQL Clone with Data Masker for SQL Server. Using SQL Provision, you can run masking sets defined in Data Masker during the image creation in SQL Clone. Masked data still looks and performs like real data and the process is simple and repeatable. Understand the technology behind SQL Clone. We explain why clones are so small, why they take seconds to create, and why SQL Server thinks it's working with a full copy of the database. You can sanitize sensitive data before it's copied from production into testing or development environments. Read about how Paymentsense, the UK’s largest merchant service provider, cut provisioning time by 85% and transformed the way teams work. Whether you want more details on our tool, a chat about provisioning best practice, or you’ve hit a snag, we’re here to help. Start cloning databases today – save up to 99% disk space and cut provisioning time from hours to seconds. From our latest survey we give you the insight into how organizations currently provision databases, and the importance they place on provisioning requirements.